The Haws 1047 Drinking Fountain is a wall mounted adult or child barrier-free unit. 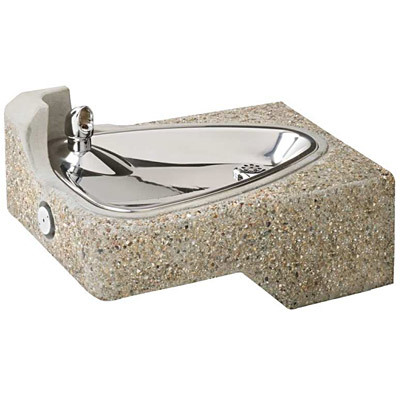 Shall include a stainless steel basin contained in a vandal-resistant, vibra-cast reinforced concrete wall bracket with exposed aggregate finish, push-button operated valve with front-accessible cartridge and flow adjustment, polished chrome-plated brass vandal-resistant bubbler head, polished chrome-plated brass vandal-resistant waste strainer with top-down access, vandal-resistant bottom plate, and chrome-plated 1-1/2" IPS trap. Perfect for either public or private settings, our concrete vibra-cast series is a great fit in "open-air" environments. Suitable in areas where weather conditions may be cause for concern, this series stands strong from the forest to the beach. Reinforced concrete vibracast design not only protects from corrosion, its Portland gray color makes it recognizable enough to locate without compromising the outdoor atmosphere. Specifically, this type of wall mounted drinking fountain may be placed in settings such as: parks, schools, and other recreational outdoor environments where the temperature remains above freezing. 3/16" steel mounting plate with supplied mounting hardware provides a solid unit base and allows for easy installation to a framed wall.